Today I am sharing some Fashion Illustration tools and shortcuts. There are multiple aids available. Everyone has their particular favorites. Here are a few I use regularly. 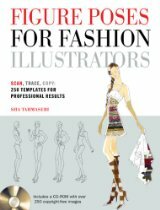 Figure Poses for Fashion Illustrators by Sha Tahmasebi- What can I say 250 copyright free images with a CD-ROM. Sha Please do a second book! Designer Nexus– Website chalk full of resources; Croquis, flats, backgrounds, swatches, tutorials and brush kits. You’ll get lost for hours! Fashionary– Fabulous tool. 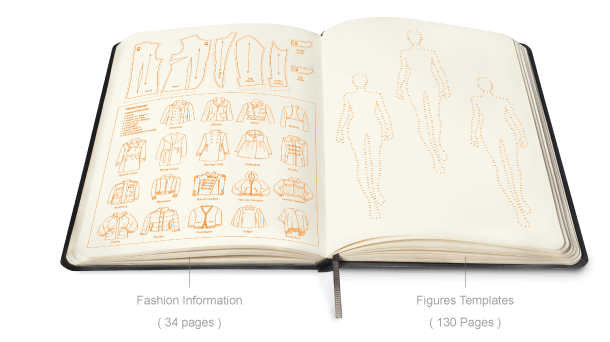 This is a sketchbook tailor made for fashion designers. 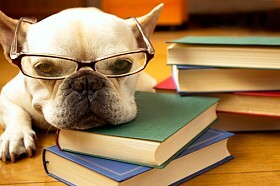 Fashionary=”Fashion+Dictionary+Diary”. It is a cross between a dictionary (intensive fashion information) and sketchbook (figure flats). Read their blog and Watch the demos- Men’s & Women’s. *If I had any complaint it is that the sketchbook covers don’t differentiate Men’s versus Women’s. Since at the time I purchased mine they only had black available I can’t tell at a glance which one is which. Do the Hokey Croquis! 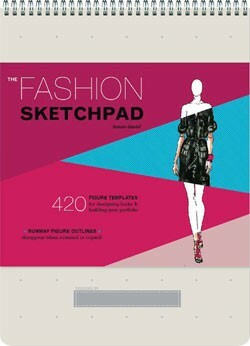 The Fashion Sketchpad by Tamar Daniel-I got the original sketchpad which is slightly too large for my taste. The travel size has been sold out for awhile so unfortunately I haven’t been able to try it out in comparison. Adobe Creative Suite (Of Course!) Illustrator √ Photoshop √ Indesign √ . Check out the tutorials on Adobe TV. Autodesk Sketchbook Pro for my iPad- I use this all the time. It has become my favorite tool. Watch one of the numerous tutorials out there. Rulers-This is the only ruler I insist you can’t live without. My latest colored Fashion Plate, “So you say.”. I created her using a mix of templates from Sha’s Book and sketchbook Pro on my iPad and of course my creativity.